"..."The Realistic Jones" is really saying there can be no such thing, of course, unless you really train yourself to swallow back your own suffocating feelings of dread (an impossibility for me, at times). Some people find Eno's writing pretentious or circuitous. I'm a big fan, though. This play felt weird on Broadway but more at home on Belmont Avenue, where we probe these things in this town. If you like marital comedies and hate them both at the same time, this is your show." "...On the surface, much of playwright Will Eno's dialogue sounds like a series of oddly poetic non-sequiturs, voiced by people who consistently misread social cues. So it goes in "The Realistic Joneses," polished to a sublime sheen by director Jeremy Wechsler in a co-production between Shattered Globe Theatre and Theater Wit. Don't let the surface fool you. There's endless profundity (and marvelous wit) embedded in the 100-minute drama. The more you listen, the more obvious that becomes." "...It's Chekhov's world, where the struggle to matter is a sad farce, and this Shattered Globe-Theater Wit coproduction astutely and affectingly captures its myriad gray tones. The cast is uniformly excellent-so good that, for once, everyone onstage is working with as many cylinders firing as the always outstanding H.B. Ward." "...Eno is clearly approaching THE REALISTIC JONESES with a particular point of view in regard to content and playwriting form, and it's not a style that will appeal to all theatergoers. But for those who appreciate absurdist theater, THE REALISTIC JONESES may hold appeal." "...No question, what we see is what Eno means. Whether you find it tedious or truthful, irritating or insightful, depends on your tolerance for the work's cunning contrasts, like the wild seascapes that surround set designer Jack Magaw's very ordinary patio and bland interiors. However "realistic" these clueless Joneses, their inconsequential incoherence is cunningly familiar." "...All four actors shine - McKenna, Reiter, and Wiens are Shattered Globe Theatre Ensemble Members - with Ward inhabiting his role so convincingly that it didn't seem like acting, more like simply being the character. Kudos to all and to Theatre Wit Artistic Director Jeremy Wechsler, who directs the production with a nuanced hand." "...Forget about trying to keep up with the Joneses. There is no competitive spirit or rivalry between the two married couples in Will Eno's quirky yet heartfelt dramatic comedy "The Realistic Joneses." Originally produced on Broadway in 2014 with an A-list cast, this quitely reflective show is receiving its Chicago premiere in a co-production between Shattered Globe Theatre and Theater Wit. Director Jeremy Wechsler, who has collaborated with Will Eno multiple times in the past, has assembled a great cast of actors and gives them all individual moments in which they shine." "...Eno's script calls for a particular attention paid to the inner rhythms and banal machinations of these two lonely couples' daily routine. But Jeremy Wechsler's direction is always placing emphasis on the wrong syllable, with little weight or sense of timing given to many of the more humorous moments. Lines that beg to be given room to breathe are rushed with no time for us to sit and soak in Eno's language and wordplay. Moments of high tension or quick-witted conversation are conversely dragged out, removing any potential momentum. And the less said about the dead air created by sluggish transitions between scenes, the better." "...Director Jeremy Wechsler and his cast have tapped into the deftly conjured, fragmented, offbeat rhythms of Eno's characters with impressive skill. Ward expertly captures Bob's alternately impatient, sardonic, lost-and-found and depressed states of being, and Reiter perfectly suggests the impatience and exhaustion that come with being a harried caretaker. Wiens brings an ideally erratic quality to the nervous, on-and-off patterns of John's responses to others. And McKenna captures the warring senses of self-doubt and hunger for accomplishment that bedevil Pony." "...This new offering by Shattered Globe Theater is led by a talented director, bringing life to a fascinating script through the skill of four, accomplished actors, and supported by a team of gifted theatre artists. It all adds up to a wonderful, absurdist production that's filled with interesting characters, spouting an array of non sequiturs and wise observations and creating unexpected humor that's tinged with an air of mystery. 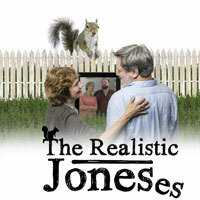 They may not be real, but they're the Realistic Joneses." "...On stage, "The Realistic Joneses" either works or it doesn't, depending upon the skill of the director, the command of the actors, and the creativity of the designers. I didn't find a single false note struck during the evening, not one moment when the play turns silly or willfully obscure. The play weaves an almost otherworldly spell over attentive and sympathetic viewers. I was so caught up in the play scene by scene that bit was only as I left the theater that I recognized what an insightful and sensitive slice of theater I'd just witnessed. One rarely comes into the presence of a production that so effectively meshes the talents of the director, actors, playwright, and designers." "...This is a solid play but perhaps not for everyone. Shattered Globe marketing materials uses a quote which says this is one of the strongest plays since Tony Kushner’s 1993 Pulitzer winner ‘Angels in America.’ Though this play is good, it’s not anywhere close to the monolith that is ‘Angels in America.’ This is a tight hour and a half stroll through the everyday lives of two couples that share the same name. In it there are nuggets of wisdom about everyday life that may not have a ton of plot-weight, but stick with you for days after. There’s a lot to unpack in this piece and surely nobody will leave saying “I didn’t get it.” Eno sticks closely to a reality we all understand; sickness, death, love and where we all fit into it." "...The Realistic Joneses is about life and the fear of death—and about the life and decline of a marriage. It’s melancholy, unsettling and sometimes funny. Playwright Will Eno seems to want us to sympathize with these four people but none of them are fully drawn characters." "...This is a well-paced flawless production with top notch performances under the expert direction of Jeremy Wechsler." "...All of our lives seem like more to us, and that is the essence of Eno's play. We are watching people who could be us dealing with difficult times as well as they can. It's nothing earth-shattering, perhaps. Or, perhaps, in its very simplicity, it is." "...The cast is loaded with talent. Reiter is superb in the delicate divide of a devoted spouse whose long-term role of facing life as caregiver is mixed with her own uncertainty opposite Ward’s delightfully crotchity, understated performance. McKenna is a bundle of kinetic energy that covers an underlying fear of the unknown while Wiens handles the whip-smart John effortlessly, exuding a confidence tinged with his own brand of mystery and confusion." "...Loyalty no matter what vs. childishly abandoning, running away, denial, or even making one-liner jokes the way a leper comic might when a finger falls off, and more-Eno's script showcases the infinite varieties of how we deal with the terrors of the grim reaper's arrival. Most of all, it's the craving for marriage and coupling connection to help us cope-that realistic Jones- that Eno's script, the superb cast and direction (Director: Jeremy Wechsler) bring to life."